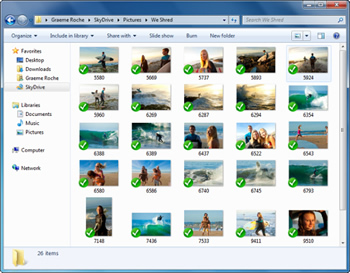 The client software for SkyDrive, Microsoft's cloud storage solution, has been updated for both Windows and Mac OS X. Build 16.4.4111.0525 adds improved Windows 8 integration, specifically with photos and goes on to address a number of bugs and quirks. The update also aims to improve performance and the overall user experience. Probably the biggest change in SkyDrive's client software is its Windows 8 photo manager integration. When a user logs in with their Microsoft account (a.k.a. Windows Live), the Windows 8 Photo app will work with photos from the associated SkyDrive account. This new feature will also work with the Windows 8 Release Preview, something Microsoft just released for public consumption today. Other changes include a bump from 150,000 files to a maximum of 10 million, improved reliability in both terms of syncing and stability and quicker folder updates. In April, Microsoft had lowered the 25GB of space to 7GB but upped the maximum file size to 2GB. More storage can be purchased at a premium. Windows 8 integration obviously isn't useful for Mac users. However, those who do use SkyDrive on their Macs may be pleased to know that the annoyingly persistent SkyDrive icon has been taken out back and shot. If you already have SkyDrive installed, the update should be pushed out automatically -- SkyDrive just needs to be running. Windows users can check to see what version they are using by right-clicking on the SkyDrive icon in the system tray (right corner of the task bar) and clicking "Settings" from the menu. For Mac users, bring the SkyDrive application into focus, click the "Settings" menu at the top of the screen and then click "About". The latest build number should be 16.4.4111.0525. If you don't have SkyDrive and would like to give it a whirl, you can download it here (Mac & PC). This installer will update to the latest version during setup. Not sure what cloud storage is best for you? You may also want to check out our very own cloud storage comparison.